Turkey is sending a message that its armed forces are still a strong and capable fighting force, despite large-scale purges of officers of the highest ranks. Picture by Pivox. CC BY-SA 4.0 via Wikimedia CommonsTurkey, it appears, is itching for a fight in Iraq and Syria. Its August incursion into Syria, through the ongoing Operation Euphrates Shield, was no doubt an important turning point. No longer an active bystander to the conflict in Syria, Turkey became an actual participant in the civil war that has been waging for over five years. There was a time when opinion polls showed that the military was the most trusted organization in the country, with 89 per cent of the population holding such views. However, this declined to 66 per cent by 2011 after the military was hit by the Ergenekon and Balyoz arrests, trials and convictions which alleged coup plotting within the military’s top brass. According to a recent survey, over the past six months trust in the army has continued to fall. This lack of faith and disappointment for the military has no doubt taken another plunge after the failed coup attempt of 15 July. There was a time when opinion polls showed that the military was the most trusted organization in the country. Turkey’s attack is two pronged. It seeks to prevent the forces of the so called Islamic State from reaching Jarablus by the Turkish border, while also preventing the armies of the PYG, which it considers an offshoot of the outlawed Kurdistan Workers Party (PKK) and deems a terrorist organisation from obtaining a contiguous foothold in the north of Syria. Since then, Turkish backed Syrian rebels captured over 1,600 square kilometers of Syrian territory west of the Euphrates river, taking territory held by both the Islamic State and the Kurdish dominated Syrian Defence Forces (SDF). Meanwhile, in Iraq, Turkey is itching to be part of the fight to liberate Mosul. In the aftermath of the 15 July attempted coup, Turkey dismissed over 1,500 military personnel, which constitute almost 50 percent of top officers. In fact, as Metin Gurcan notes in Al-Monitor, the Turkish government has been advertising in newspapers to fill 25,000 vacancies within the armed forces. Under such astonishing circumstances there was the risk that Turkey’s enemies would consider Turkey’s military vulnerable and unprepared, having lost its morale, confidence and ability to fight. The breakdown of the ceasefire with the PKK last year led to a steep upsurge of violence in the southeast of the country. Since the summer of 2015 the conflict between the PKK and the Turkish state intensified to reach levels that had not been seen in well over a decade. The day-to-day lives of ordinary Kurds in the southeast of Turkey became unbearable, so much so that residents in some towns, cities and provinces began digging ditches and barricades. As a result, the security services would fire upon PKK targets from long distances causing civilian death and collateral damage. According to a March 2016 report by the International Crisis Group, violence in the southeast led to the displacement of 355,000 civilians with over 250 non combatants killed. These numbers are excluding the October 2015 Ankara bombings which struck a rally organized by the pro-Kurdish Peoples’ Democratic Party (HDP) killing 103 civilians ahead of the general elections. It also excludes the twin blasts in Diyarbakir which claimed 4 lives, also just ahead of the elections. The violence has yet to abate. The breakdown of the ceasefire with the PKK last year led to a steep upsurge of violence in the southeast of the country. It is in this context that Turkey’s principle enemies, the PKK and the so called Islamic state, launched major and audacious attacks on Turkish soil in 2016. On 24 August, the PKK killed six soldiers in two attacks in the Kurdish populated Southeast using bombs, long range weapons and rocket launchers. This came after the PKK, on the 17 and 18 of August, bombed police stations and police vehicles in a spate of stacks also in the Southeast of the country killing 10 and wounding hundreds. Meanwhile, the so called Islamic State sent a suicide bomber to the Turkish border city of Gaziantep. In a horrific attack at a wedding party, it claimed the lives of over 50 people, many of them minors. Ankara needed to do something drastic in order to restore its deterrence and to send a message to the so called Islamic State, the PKK, its Syrian PYG affiliates and, no doubt, the rest of the world, that despite the post-coup purges, Turkey’s armed forces were still in business and ready to take action. Ankara is also sending a message to the new US administration in waiting that Turkey expects Washington’s support in keeping Kurdish forces in Syria in check and to withdraw from the west of the Euphrates. 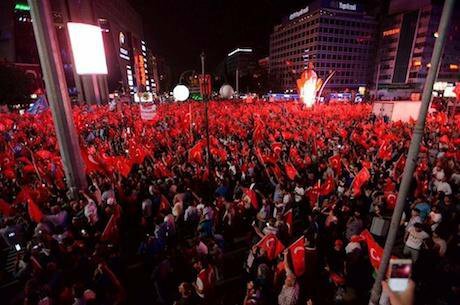 Ankara’s message is not limited to the so called Islamic State, the Kurds and the international arena. Perhaps its most important recipient was the Turkish public, especially designed to restore their faith in the military. The Turkish armed forces have traditionally been a source of national pride. It is common to hear Turks express that every Turkish boy is born a soldier. Members of Turkey’s conscripted army are called a mehmetçik, a term of endearment and familiarity. The armed forces are even referred to as the Peygamber Ocağı (The hearts of the Prophet). With Turkey’s homeland under threat from the spillover form the Syrian civil war, the public’s lack of faith in the armed forces was worrying to the government and needed to be remedied. It is in this light that Turkey is conducting Operation Euphrates Shield and involving itself in the Mosul operation. It is a message to the Turkish public that its armed forces remain strong, willing and capable of facing threats to the country’s national security. The strength of this message will no doubt rest on the success of Turkey’s foray into Syria and Iraq in avoiding Turkish casualties.